As you can see Jacques is enjoying a full recovery from his recent cat-astrophe. Older, but no wiser: the other day he cornered a cat in the barn, a huge, lumbering old thing, and would not back off. We had to pick him up and create an escape route for Tubby Kitty. TK had claimed an upholstered chair, torn off its wrapping and left it quite a mess, so feel no pity for the guy. 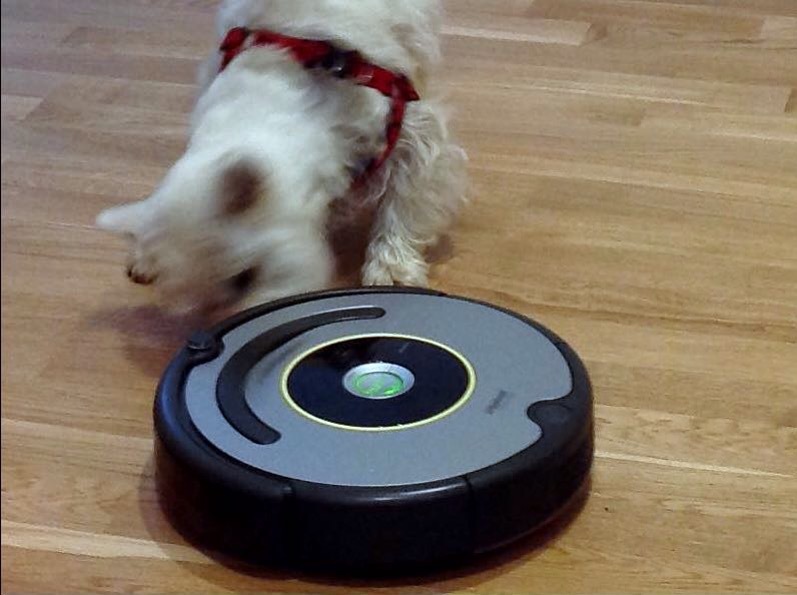 Anyway, here Jacques is showing the Roomba who is boss. I’m amazed that I nonetheless have a clean floor. How do you rate your Roomba? Gerard, I love my Roomba. The first time it fills up quickly but that has to do with how dirty the place was. Later forays turn up much less stuff. In any case, dumping the dirt container is much less work than vacuuming. It goes under the furniture, way back under the bed and all. Honestly, I would never do that. Once in a while you probably have to actually vacuum but in general it is just nice to do all the other cleaning and let the Roomba do its thing. No, the Roomba gods know about such things. Thus the Roomba robots sense when they reach a step and back away. The only odd thing that ever happens is that, now and again, the Roomba doesn’t find its way back to the docking station. Glad that the boy is better…though it looks as if he’ll always bear a grudge where cats are concerned. Well, it’s strange. He kept after that cat in the garage as if he had no clue that this one, too, could do some damage. It appeared that he hadn’t learned a thing. In the end, I held my squirming pup while the guys moved furniture and gave the cat an escape route. Then they had to close the garage door. I think Jacques would have chased him right down the street. The cat that attacked him was out in the dark. Maybe Jacques didn’t know what hit him.